Vancity manager Omar (left) presents a $500 cheque to HSWS secretary Emily (center with daughter Joan) and HSWS president Robbin (right) for Salmon Come Home. 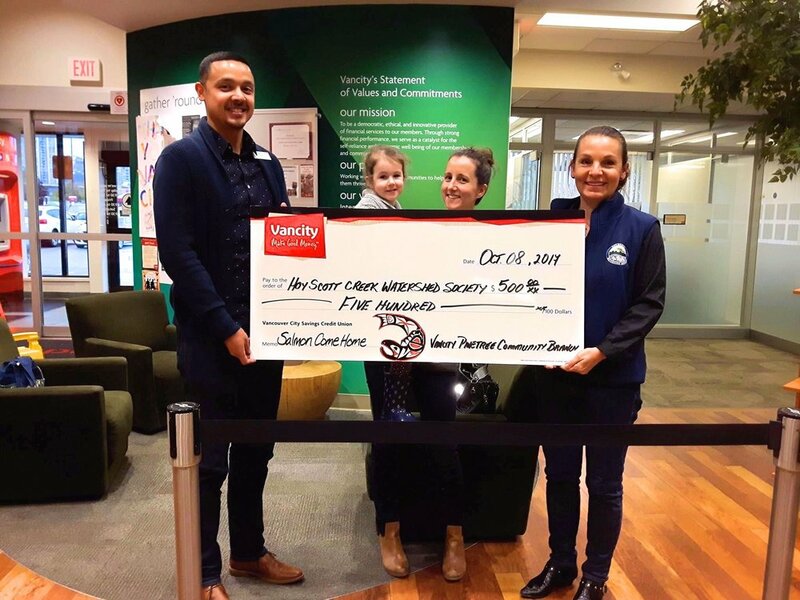 A huge thank you to Vancity Credit Union, Pinetree branch in Coquitlam, for their continued support of the Hoy-Scott Watershed Society, as earlier this month they donated $500.00 toward Salmon Come Home, one of the City of Coquitlam's signature events held this year on Sunday, October 22 from 11 a.m. to 3 p.m. at Hoy Creek Hatchery. 2017 marks the 25th anniversary of the community event which is a collaboration between the Municipality and the Society. "As a non-profit group, we really appreciate and encourage local business support with any or all of our initiatives," said Robbin Whachell, President, Hoy-Scott Watershed Society. "Thank you Vancity for helping us highlight the importance of our environment and the wonder of the salmon." The salmon is a unique creature in that it returns to the exact stream that is was born to spawn and die. Peak viewing of salmon spawning in Hoy Creek is between mid-October and December.